The Holy Ghost Byzantine Rite Catholic Parish was founded by humble, God-fearing sacrificial people, who despite the various difficulties and obstacles encountered upon their arrival to this new land, valiantly fought to preserve their heritage and the traditions of their forbearers who were Catholic in faith and Byzantine in ritual. These people emigrated from the area of the Carpathian Mountains in what was then the Austro-Hungarian Empire which after World War I became known as Czechoslovakia. Despite linguistic handicaps which relegated them to the more menial tasks around the refinery plants in Philadelphia, the founding fathers of Holy Ghost, nevertheless, strove to the best of their abilities by their zeal and industry to make of themselves exemplary citizens of our beloved country. The inspiring and motivating force behind these people which assisted them in overcoming their language and educational barriers and save them the impetus and moral strength to improve themselves was their extreme love of God and their Byzantine traditions. Catholic in faith, they earnestly desired to worship God in their own rite in which they actively participated since childhood. 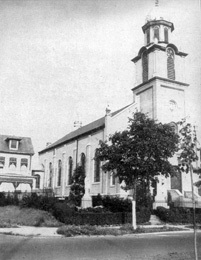 Holy Ghost Church was formally founded on May 23, 1891, with approximately six hundred souls. 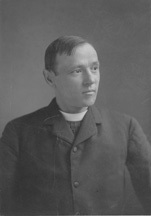 During the pastorate of the first resident pastor, Father John Hrabar, the building of the first Holy Ghost Church at 1927-29 West Passyunk Avenue was started in 1894 and solemnly dedicated by the Most Reverend Patrick John Ryan. Archbishop of Philadelphia on April 28, 1895 This church was a small brick edifice with a seating capacity of one hundred and fifty. Its design was simple with an icon screen and an altar both of wood. This modest little church served our people until 1923 when they moved to the present location during the pastorate of Father Andrew Symko. The new structure seated four hundred and fifty with a plain white interior and wooden screen. Being started in 1922, this church was solemnly blessed on Thanksgiving Day, November 29, 1923, by His Eminence, �Dennis Cardinal Dougherty of the Archdiocese of Philadelphia. Between 1933 and 1947 Father Constantine Roskovics and �Eugene Runtagh had various improvements completed along with plans for a Community Center. In 1948, during the pastorate of John Pavlick a complete redecoration of the church interior, including a bronze icon screen and colorful Byzantine style stained glass windows were installed by the Rambusch Decorating Company of New York. Once again in 1961, �Father Andrew Sokol and after him �Father Paul Vasko in 1965 had several projects undertaken to improve all of the church properties including the Rectory and Community Center (Auditorium). Between 1973 and 1999 Holy Ghost parish was served by the following Pastors: Father Francis Gera; �Father John Danilak; Father John Custer; and Father Eugene Hutter. In the year of our Lord 1991, under the pastorate of Father Jack Custer, Holy Ghost Church's interior was redecorated for the celebration of its 100th anniversary. Likewise, in 2003-2004, the parish continued this investment for the future by beginning an extensive project to restore the Church, BCD Center, and parish grounds under the direction of Father Edward Higgins. The church is under the spiritual leadership of Father Edward J. Higgins and within the jurisdiction of the Byzantine Catholic Eparchy of Passaic, NJ, currently served by Most Rev. Kurt Burnette. Others before us have sown the seed and we have reaped the harvest of their labours. We are, indeed, humbly grateful to Almighty God who continues to help and guide us with His Holy Spirit and thus give further growth to our fervent and sincere efforts. * Images were provided by the Philadelphia Archdiocesan Historical Research Center.